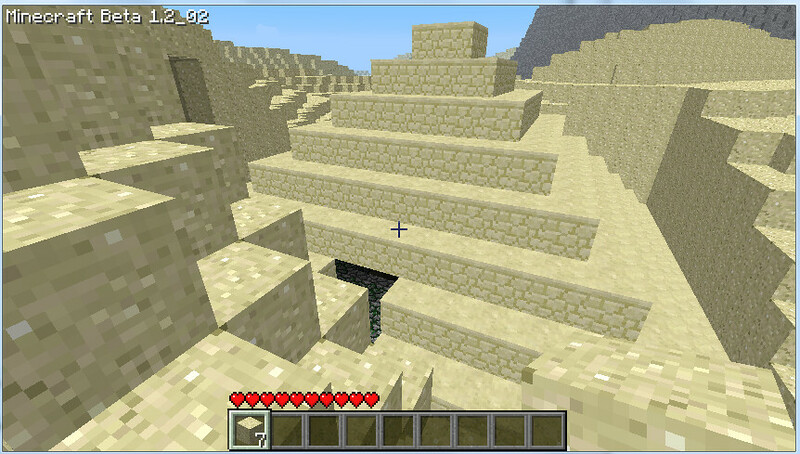 I've updated the Primordial Desert Map Generator to work under Minecraft Version 1.2.5. For those of you not familar with the generator, this one makes a desert of sand dunes, with a few hard to find oases with trees. 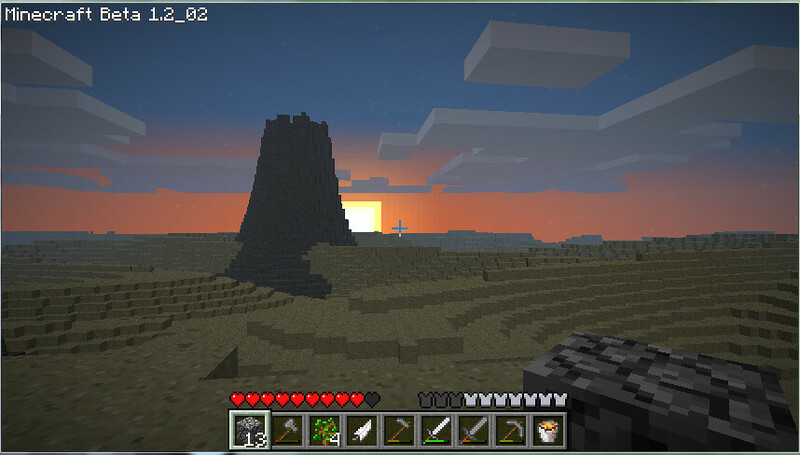 There are giant cliffs and volcanoes, along with some trap-filled dungeons, and deeper down, some ore-filled caves. I haven't really made any changes to this other than to plug it into my most recent engine, so this should work exactly like the old one, except now it generates a nether version of the map that's identical to the overworld version. 2. Put the .exe somewhere on your system and run it. 3. It will ask you for a world name and a size in chunks. The world it generates will be X by X chunks, where X is the number you give. If you want, you can specify dune parameters too, but you don't need to. 4. Once the generator is done (it will say "press enter to exit") there should be a folder in the same directory as the .exe with the name you gave in step 3. 5. Copy this new folder to %appdata%\.minecraft\saves (or wherever the save files for Minecraft are kept on your system). 6. Run Minecraft and select the world that corresponds with the name you gave to play. And I just realized I'd called the old version "V2". Um, let's pretend that was V1. Excellent! I look forward to trying this out - have you seeded plants and ores from the newer minecraft version? Unfortunately it does suffer from occasional wall breaches - I'm assuming the cave system generator for new areas in minecraft is also piercing the walls into the desert. It's far more difficult since the introduction of hunger to the game. Yeah, the desert would be nice with some cacti. Ooh, ooh! I was JUST thinking about how much fun I had with the old release! Glad to see it's been updated! Yaaaayyy! Let's see how big of a map I can make.. This oughta be fun. There's cacti in the dungeons I think as like a spike pit trap. What this needs, is a sky dungeon. Okay, maybe "psychotic Russian vampire" was a bit harsh. Look in the dungeons of the world, specifically for a trap that involves cactus. Take them back to the surface, start a farm. Also, I've noticed that hunger is a huge problem now as well... Oh well, I'll deal with it. It doesn't help that no passive mobs are spawning on my oasis... but I'm working around that. Could you post a few pics of the nether version? I'd like to see what it looks like before I go to the trouble to get there. Or answer this question: When you say "Identical to the overworld version", do you mean that it's Exactly the same? Or that it's sort of the same but uses nether blocks? Edit: Noticed people asking for mac compatibility already, and saw it a lot on other generator threads. I'm currently generating a couple of maps, if you'd like I could try to get them uploaded. Edit 2: Also (yes, I know I'm putting a lot into this post), could you do something about the biomes in this map? It's kind of annoying to find rain and snow in a giant desert, it doesn't really fit... Just a program to make the whole thing desert would be nice. Thanks for updating this, it's my favorite of your generators. These maps are super hostile, Their creator is evil (that's a good thing), And THE CAKE IS A LIE.---I use Map Generators! Bored of normal Minecraft? Try them! I've been to the nether - it uses the same terrain as the normal world. Not sure about water though, I've not come across an oasis in the nether. You download the .exe, run it, answer the questions that the program gives you and wait for it to finish. Look for the resulting save file in the same place as the .exe, drag the whole thing into your saves folder in .minecraft. Find the Run program, or the search bar on windows 7, and type %appdata% into it. Look for .minecraft in the window that opens. This only comes in a .exe, and so does not run on Macs. If this doesn't help, please post again and say what part you're getting stuck on. One of my favorite maps generators. Updated to 1.2.5. My day is complete. Anyone can fly. The secret is to throw yourself at the ground and miss. This is my favorite generator. I've put tons of time into the worlds generated with it. Have you spoken with Jens or Notch about potentially incorporating it into the main game, or maybe taking inspirations from it? It's seriously way more fun than normal mode, even with hunger mechanics it wasn't really designed for. It seems like animals are unable to spawn anywhere in the desert or the oasis, i have found several large oasis' and none of them ever had animals spawn in them. 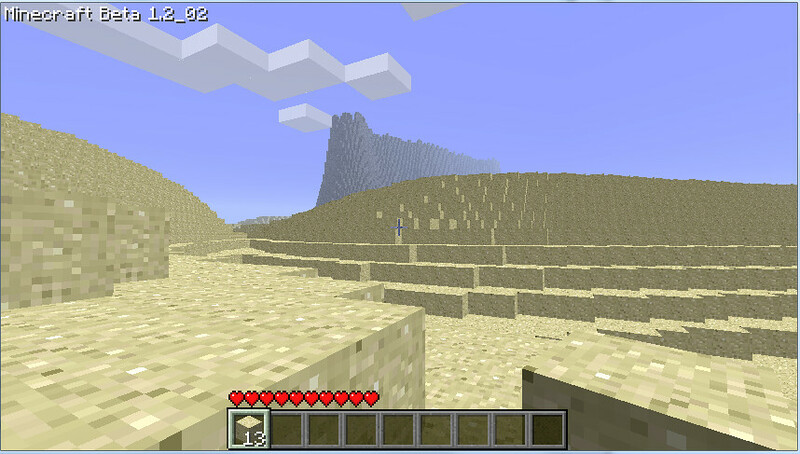 Possibly because the terrain is pregenerated it counts as already populated, and therefore nothing new spawns there. You'd need to go to an unexplored area, therefore outside of the desert. It just makes the game harder as you are now reliant on spiders for wool and zombies for meat.